For those at age 50 or older, it’s readily apparent that the body is not quite like it used to be. Muscle and joint aches increase and fatigue sets in more easily. While this is all a natural part of aging, staying fit and healthy can still remain an achievable priority. Warming up before a workout increases circulation, raises heart rate and body temperature, prepares muscles for exercise. Warm-ups can include a combination of light cardio and light stretching, with a particular focus on the specific muscles you’ll be exercising. A general lower body warm-up such as light treadmill workout can benefit all muscles. Because bone density and muscle mass begins to drop after age 50, resistance exercise becomes a far more critical part of your exercise program. Also referred to as weight training, resistance training is the only type of exercise that can slow or even reverse the declines in muscle mass and bone density – conditions that used to be considered inevitable consequences of aging. As we age, our muscles get smaller and begin to contract. We also develop a higher fat content. Resistance training can alter this path. Because bone density and muscle mass drops after 50, resistance training is also an important part of a total body exercise program. Increasing muscle and bone strength also prevents falls and fractures. This does not mean that we switch from cardio to resistance training – anything that gets your heart pumping should be integrated into fitness program. Daily cardio workouts can include a daily brisk walk, running, biking or swimming. If finding 30 minutes each day is a challenge for your busy schedule, I often recommend ‘fitness snacking’ – taking a few minutes several times each day for exercise. Importantly, each and every exercise program for the 50+ needs to incorporate stretches. Stretching enables our body to remain flexible – and staying flexible is vital for those 50 and beyond as tendons – which are part of our lean body mass – begin to decrease. Warming up before your exercise program is also the way to increase circulation, raise your heart rate and prepare your muscles for exercise. Stretch all of your major muscle groups a minimum of 2-3 times each week, ideally after each workout when the body’s temperature is raised. As we get older many individuals begin to think less of their core, which can result in having a bad back. This is why abdominal exercise need to continue past 50. A workout of 30 minutes twice a week should include pushups, squats and lunges. Engage in a few minutes of abdominal exercises by adding crunches to your routine. Keep your back on the floor and bring your knees half-way (not all the way) up. Begin with 10 repetitions and add more as you progress. Taking a day off in between workouts gives muscles time to recover, and those over 50 may require additional recovery as tissue recovery time increases. Over 20 years ago the AB Doer made its debut to address each of these critical exercise functions. The objective with the AB Doer was to create an exercise machine for everyone, and for every age. The result is a single fun and easy fitness system that works every muscle region without requiring multiple pieces of complicated equipment. 20 years following the launch of the original AB Doer, the newest version of the invention, the AB Doer 360, a complete fitness system. It condenses workout times by combining multiple motions all at the same time. The AB Doer 360 effectively addresses all of the above fitness objectives, delivering a total body workout. Its patented multidirectional technology works every region of the waistline, including all major abdominal muscles all the way around your midsection for a 360 degree workout. At the heart of the AB Doer 360 is an anatomically-designed, contouring Dynamic Fluidity Seat that engages all of the muscles surrounding the back and spine – delivering 360º results around the midsection, while it’s swivel action targets the pelvic/buttock regions and hips and legs. As the user moves with the Dynamic Fluidity Seat, more muscles are automatically engaged to react to the seat’s ”instability” movements and fluctuations. The Comfort Groove to take pressure off the pelvis, hip joints and tailbone, the brand new dual-foam roller system to comfort the back muscles on both sides of the spine for a revitalizing back massage. At the heart of the AB Doer 360 is the Core Support Column that brings total spinal/back mobility to the body for natural movement. The AB Doer 360 also adds a special bonus feature to 50+ users – an exclusively designed ‘Dual-Roller’ durable foam pads roll to rub and knead back muscles while using the machine for a simultaneous workout and massage. 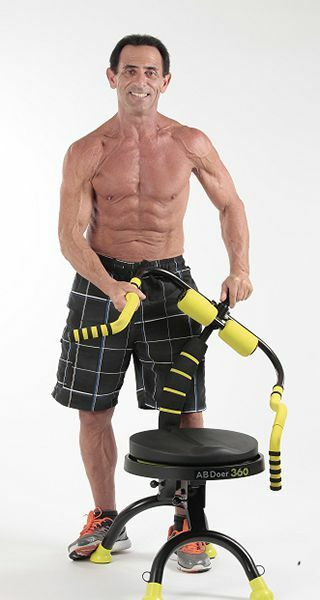 Achieving your exercises in a sitting position is a real advantage for the 50+ as the AB Doer 360’s multiple-patented technologies tone muscle (anaerobic), condition cardio (aerobic) and deliver a refreshing massage, all at the same time for the ultimate 50+ abdominal training and calorie-reducing workout. The AB Doer 360 is ideal for baby boomers, delivering the easiest and fastest way to maintain body firmness and flexibility. And there is never a need to waste time re-positioning or re-setting the machine in order to transition from motion to motion. With more than five million users worldwide, the AB Doer technology ranks among the most successful fitness systems in the world. Re-engineered, the AB Doer 360 is an extraordinary fitness partner for the 50+. Give the AB Doer 360 a try – and your satisfaction is 100% guaranteed. Please visit getabdoer360.com for all the information you need to bring the AB Doer 360 home, and make it an important part of your health and wellness for many years to come.